The third time that my grandfather, Emiliano Frazzini, came to the US in 1912, he went to the home of his uncle Teridano diTella in Dawson, NM. Teridano first arrived in the US about 1901, living in Trinidad, CO. He moved to Dawson, New Mexico about 1906 where he lived until his death in 1944. He is buried at the Mt. Calvary Cemetery in Raton, NM. 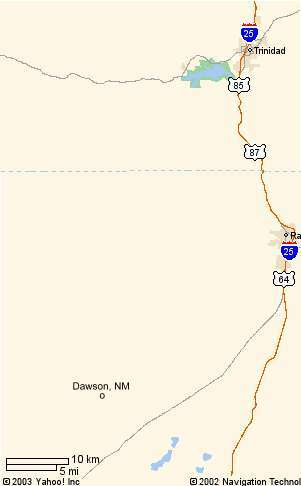 Here is a simple map showing how close together are Dawson NM, Raton, NM and Trinidad, CO.
5 Sep 2004 - I added photos that I scanned at the home of Teridano's grandson, Giuliano Colajanni on my trip to Italy in 2004. Teridano diTella is Emiliano's wife, Lucrezia Carlini's, uncle (her mother, Doristella diTella's brother). No one in my family even remembered him, let alone knew he had come to the US. On this page, I will document what I can find out about Teridano and his time in in the US. I've tried to arrange this page in cronological order. Teridano's grandson, Giuliano, received documentation from Campobasso about Teridano's time in the military. He sent me a copy. From that record, he entered service in the Italian Army on 3 Dec 1897 and served until 16 Sep 1900. The record covers the period up until 31 Dec 1918. He was a "caporale maggiore" in the 5th Artillery Regiment (5o Reggto Artiglieria). Possibly stationed in Torino (Turin) since that is where the photo was taken. He received permission to leave the country on: 14 Nov 1900, 1 Mar 1906. His first World War service was from 11 May 1915 up to 31 December 1918. 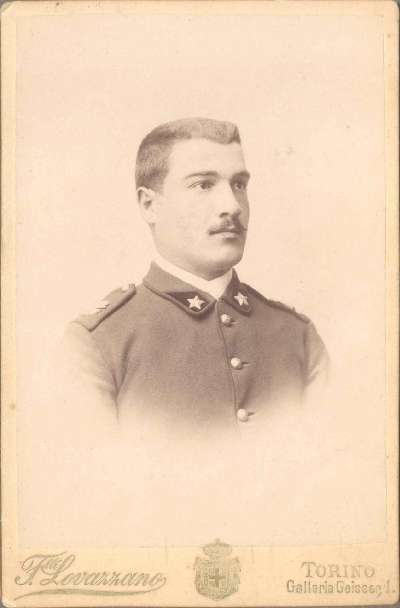 Photo from his military service in the Italian army - About 1899. There was some discussion on the ancestry.com Italian Miliary board. I got an email from Steve who pointed me to this message which contained a photo that someone thought looked like Teridano. Teridano, 23y, first arrived in the US, via Ellis Island, on 20 Dec 1900 on the Furst Bismark sailing from Naples. Occupation: carpenter. He was going to the home of his brother Cipriano in East Glastonbury, CT. Wilberta Illig found this manifest for me in Nov 2006. On Ellis Island, he was indexed as "Feredaus DiCella". On ancestry.com, he was indexed as "Leredans Di Cella". In his Italian military record, it shows that he was given permission to leave Italy for the United States on 14 Nov 1900. In 1904, Teridano returned to SPA to marry Esterina Angelica diSanza. They were married on 15 Jan 1905. Their first child, Renato, was born 22 Mar 1906. As determined by grandson, Giuliano Colajanni, the printing on the trunk (3 initials) was originally "T D T" for Teridano di Tella. 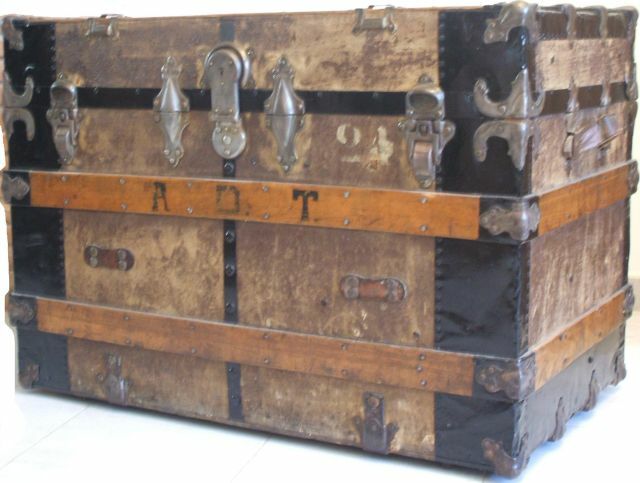 After Teridano's death, the trunk was most likely used by his son Renato when he went to school. Thus the initials were changed to "R D T". You can still see that the first initial was a "T". Its likely that after Teridano's death, his belongings were returned to SPA in this trunk. From Ellis Island: 25 May 1906, 29 yrs (his year of birth would be 1877 which matches the SPA Nati records), married, occupation - Carpenter, going to cousin - Rainero diGiacomo, Brooklyn NY, previously in US from 1901-1904 in Hartford, CT. Place of residence was listed as "Campobasso". The ship was the Republic. Carlo diIullo (going to cousin, Filippo Carlini, Dawson NM) (but name was crossed out). Raffaele Colaizzi, Carlo diIullo as well as Teridano were crossed out. Where they just listed twice in the manifest? In his Italian military record, it shows that he was given permission to leave Italy for New York on 1 Mar 1906. Teridano - about 1905 - Maybe a passport photo? Even though, this arrival manifest says that he was going to Hartford, CT, the 1910 census (see below) and his 1911 arrival (see below) says he lived in Dawson from 1906 to 1910. 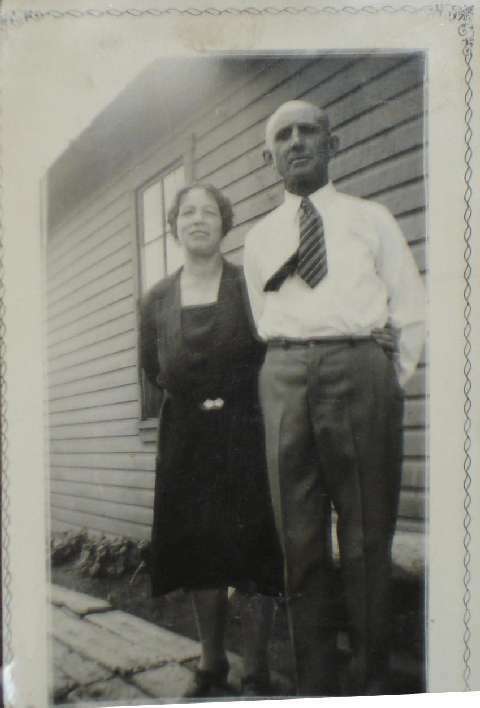 Another great-granduncle of mine, Tommaso Cipriano diTella, Teridano's brother, went to Teridano's home in Dawson, NM when he arrived in the US (From Ellis Island: 7 May 1907, 34y, married, mason, going to brother Teridano diTella, previously in the US from 1897 to 1906. Cipriano did not stay in the US but at some time moved back to live in SPA. Read more on his web page, click on the link. Teridano Ditella found in Census Microfilm Records: Arizona, Idaho, New Mexico, Utah, Wyoming, 1910. Census taken 25 Apr. In 1910, Teridano returned to SPA. Their second child, Vinicio, was born on 17 May 1911. Wilberta diVincenzo Illig found this record. It is amazing that she found it since it was poorly indexed. You have to search for the missing manifest. I found it at frames 379 and 378. He was 33 years old, occupation - Carpenter, wife in SPA - Esterina. Going to Dawson, New Mexico. Going to friend - Antonio Morgano, previously in Dawson from 1906 to 1910. This may be when Teridano first moved to Dawson. My granduncle Felice Amato Carlini (my grandmother's brother who settled in Ely, NV) also went to Teridano's home in Dawson, NM when he arrived in the US (From Ellis Island: 15 Feb 1912, 17 yrs, single, to: Uncle Teridano diTella, Dawson NM, father Giuseppe). In 1914, Teridano returned to SPA, apparently for 6 years. Their daughter, Licia, was born 14 Dec 1914 and their fourth child, Goffredo, was born on 21 Aug 1916. 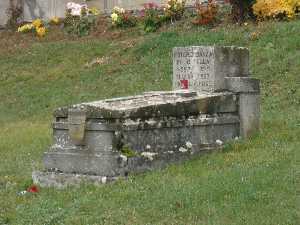 According to his grandson, Giuliano, Teridano was in SPA during the first World War. From Teridano's military records, he registered for WWI Italian military service on 11 Mar 1914. From Teridano's military record, he was released from WWI military service on 31 Dec 1918. From the record, it does not appear that he actually served in the military. This does confirm that he spent the time of WWI in Italy. Teridano is not listed in the index for the 1920 census. The Census was taken in January and from the following Boston arrival info, he returned to the US in March. I checked New Mexico, California and Nevada for both him and his brother, Cipriano - could not find either one. All of these other people were going to Ely, NV. This entry was to start his application for citizenship. The requirement was that you had to live in the US for 5 years before you could become a citizen. I found that Teridano lived in East Ely, NV for a short time later in 1920. In Aug 2007, I spent 5 days in Ely, NV doing genealogy research at the East Ely Railroad Depot Museum . That museum has the records from the Nevada Northern Railway Company. Many sampietresi worked on that railroad. They have records of workers from 1906 until 1983. That is the last entry. Teridano must have quit the job. Maybe he did not like the work on the railroad. His last pay was for $15.25. The records do not show a paycheck number so I assume that payment was never made to Teridano. This is Rinaldo deAmicis, son of Severina diTella and Antonio deAmicis. He married Gina Maria Carmina Carlino. My cousin, Alfonso diSanza, helped me get the spelling of the last name correct, he confirmed the identity with his mother Laura diTella. Gina was my mother's baptism Godmother. Previously in the US from 1912 to 1914, in NV. Occupation: carpenter.Going to the home of his uncle, Teridano diTella, Box 199, East Ely, NV. Wife in SPA, Gina Carlini. Travelled with Luigi diIullo. 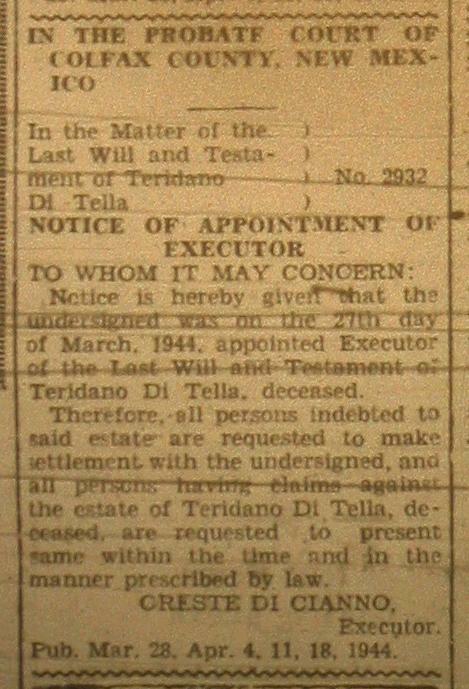 So here in October 1920, Teridano must have still been in East Ely. Sometime in the early 1920's, Teridano moved to back to Dawson. The name of Teridano's wife is not listed on the document. According to a note: "Under act of September 22, 1922, husband's naturalization does not make wife a citizen". Next, he [Fenlon] set up night classes in English and American citizenship for adults. By 1924, sixty had graduated from the "Naturalization" course. From "Coal Town - The Life and Times of Dawson, New Mexico", pg 77, ©Toby Smith. A notation on the 1920 arrival manifest shows this date stamped with "Entry for Permanent" verifed 16 Jun 1928. He was already a citizen by now so this might have something to do with getting a Passport. I believe John Moruzzi was from Udine so the reporter got the information almost correct - Teridano was from San Pietro Avellana. Teridano expected to return with his wife, Esterina, and four children. But that did not happen. 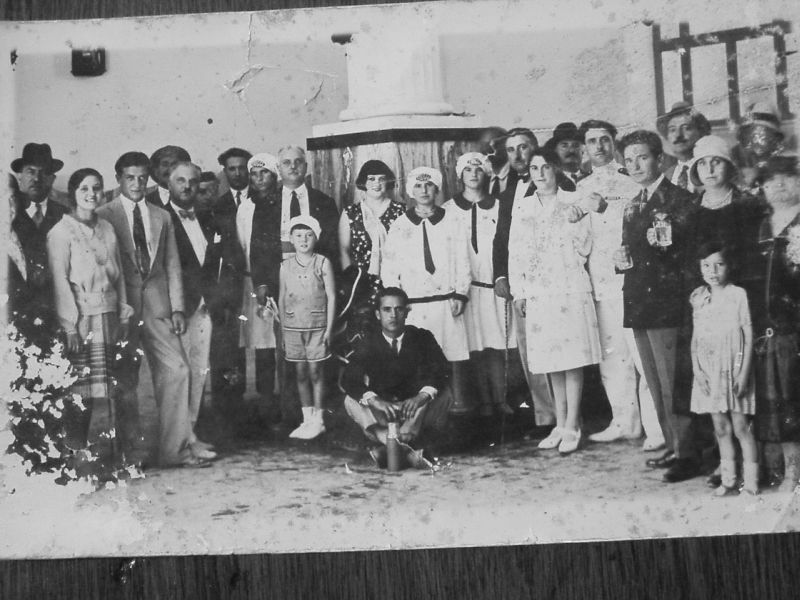 1929 Photo taken in Fiuggi, Italy. Teridano is third from left. His wife Esterina is next to him. His grandson, Giuliano believes this is the last trip that Teridano made to Italy. The first person at left is Teridano's son Vinicio (Air Force colonel). We don't know who any of the other people are. Here is another photo identified by Giuliano as taken in Fiuggi in 1929. Third from left, is Vinicio diTella, Teridano's son. Giuliano does not know any of the other people in this photo. John ("Gio Batta" on the manifest) Moruzzi, Santa Rugo Moruzzi and Teridano returned from Italy, leaving Naples on the Roma on 24 Aug 1929 and arrived at New York on 2 Sep 1929. Teridano was 52y, a US Citizen, going to Box 1112, Dawson, NM. Passport number 950 issued at Washington, DC 10 Apr 1929. John and Santa were going to the same address and their passports were issued on the same date. 12 Sep 1929 Dawson news. Teridano was back in Dawson but without his family. 19 Sep 1929 Dawson News - Dawson Celebrates 7th Annual Community Day. You had to weigh at least 190 pounds to enter this race. Terry's age of 54, would match with the birth date of 1877 for our Teridano. He lived next door to Oreste and Florence diCianno. My mother, Mary, and I can't find any pictures of Terry. I found one of Oreste and myself in Dawson. We believe my Aunt Florence had pictures, but since she passed away many years ago, we have no idea where they would be. Her second husband, Joe Sepich, also passed away. Therefore, what pictures she had are gone. 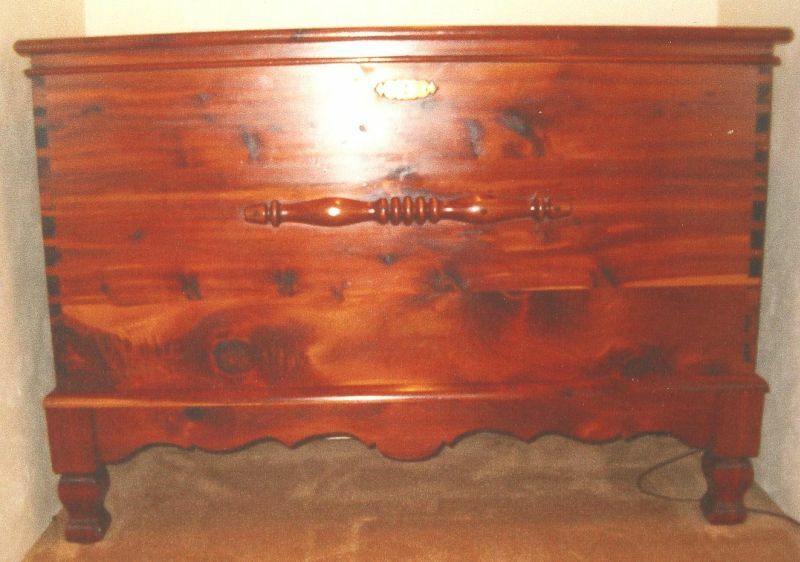 Terry made Florence and Mary a cedar chest. Florence gave her cedar chest to me and Mary has the one Terry made her. They are beautiful and have no nails. They are put together with pegs and joints. This is all the information that I have. Hope this will be a little helpful. One of two Cedar Chests made by Teridano diTella. They were given to sisters, Florence and Mary diLorenzo. This one was the one given to Florence - now owned by neice, Elaine Arcangeli Wade. John Moruzzi - In searching the microfilmed records from St John the Baptist Church in Dawson, I found both John and Santa listed as godparents and confirmation sponsors (twice for children of Domenico Palumbo) from 1928 to 1932. The name in those records appears to be spelled Muruzzi or Moruzzi. I checked Ellis Island and Moruzzi appears to be a good name. The family name is not from San Pietro Avellana. I found two records for Giovanni but neither are this John. Santa's last name was shown one time as Rugo. There are lots of Rugo's from Tramonti di Sotto, Udine, Italy. 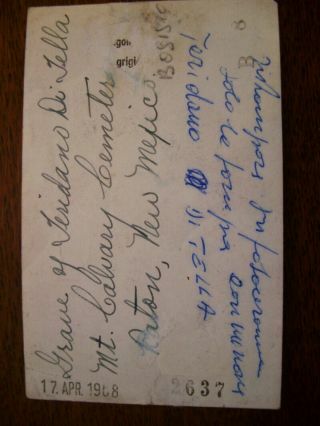 I did find a Santa Moruzzi and two children who came over on 15 May 1911. This was a "detained aliens" list, reason "husband". From the 1930 census, we know our Santa had two children in Italy and all three of them immigrated in 1911. Does not list a Dawson destination. Then I found the actual manifest which lists Santa (30y), Margherita (6y) and Erminio (2y). Ages match pretty well. From Tramonti, Italy. Going to husband, "Gio. Battista Moruzzi" in Brooklyn NY. I found a Giov. Batt. 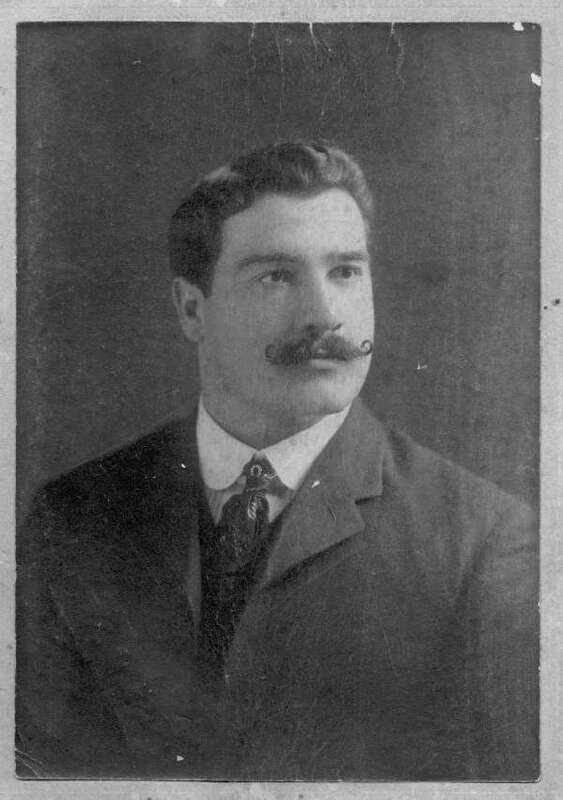 Moruzzi, 27y, who entered on May 6, 1905. Going to New York, previously in US from 1902 to 1905. Married. Travelled with Vittorio Moruzzi., 24y (I would guess a brother). Another Giov Batt who entered on March 2, 1910. A sculptor, 32y, naturalized. Lists wife "Santi" living in Tramonti. Going to Stockbridge, Mass. The 1920 Census shows the parents and five children living in Pueblo Colorado. Name spelled as Moruzzi. Series: T625 Roll: 169 Page: 279. (oldest son Pasquale 17y, came over 25 Oct 1919 via Ellis Island). I have received a copy of his death certificate. It indicates that he died in Dawson of a cerebral hemorrage. It says he was born in Campone, Italy but I can't seem to find such a town. He lived in house #1910 in Dawson at the time of his death and was buried in Pueblo, CO. He had been in the US for 34 years and in Colfax County for 13 years. Informant was Mrs Clyde Green (daughter) from Pueblo, CO.
Hello Mark, my name is Della Santa Moruzzi Skul. I am the granddaughter of John B. Moruzzi. My brother John gave me a copy of the info that he received and I don't know if he has contacted you or not. We don't have a lot of information about our grandfather, unfortunately my dad's side of the family were very tight lipped. I found some info about him on the internet at Ellis Island, so armed with that when I went to Europe last year I tried to find out something but had little success due to the fact that I had very little time in Italy. We do plan to make another trip next year and hopefully I can find something. We know that they came from the area around Udina, also they were in Cromanto di Lotto and Tramonti. I have had no luck in finding anything in those areas. I did find a mention of his name in Austria. I also knew that they spoke Friulian. That country was taken over by Italy. In any case if you can get me something to look for when I go next year I will try to find some info for you. Again, I am sorry that we know so little about our grandparents or your uncle Terry. As far as I know none of the people in this picture (Mark's note: the Fiuggi photo) are my grandparents. We have lost almost all of our older generation so there it is. Take care and good luck with your search. Mrs. Clyde Green was the only daughter of Santa and John. My aunt of course. She lived here before my parents came to Pueblo. Her name was Margarite and she passed away when she was 90. My family moved here when I was 14 months old but I don't know how long they were here before us. I know that the 10 acres of land that they had was bought right after my grandfather came to America, or at least that is what we have assumed all these years. John (grandpa) is buried in Roselawn Cemetery here in Pueblo. Della sent me this photo of John and Santa. "I have received a copy of his death certificate. It indicates that he died in Dawson of a cerebral hemorrage. It says he was born in Campone, Italy but I can't seem to find such a town." Campone is a frazione (village/hamlet) in the Comune (town/smallest unit of government) of Tramonti di Sotto. This is now in the Provincia di Pordenone, but that province was only created in the 1960s I believe. During the period of immigration it was the Provincia di Udine. There is also a city of Udine, but when the people from Tramonti di Sotto referred to Udine, they were usually referring to the provincia. Google Earth knows how to find Campone, it is along a road running east from the main river valley. Rugo is a common name in Tramonti di Sotto dating back into the 1400s. Moruzzi is also found there back to about 1600. In the late 1700s, Rugo was the second most common name and Moruzzi the third most common name in Tramonti di Sotto. There was a custom of using modifying names, sopranome, to identify branches of a family, often referring to a prominent member of a particular branch of the family or a geographic location where that branch lived. One of the modifying names for Moruzzi refers to Campone. Just below that you have a note from Della: "We know that they came from the area around Udina, also they were in Cromanto di Lotto and Tramonti". I believe that those are all referring to the same place. At Ellis Island I was able to catalogue about 30 ways of misspelling Tramonti, one of which was the Cromanto di Lotto that Della mentioned, so not a separate place. What with translating the Friulan language into regular Italian or French at the point of embarkation and then people with no great knowledge trying to read the handwriting from 100 years ago to produce the text version of the Ellis Island manifests, there are a lot of errors. There is also a Comune di Tramonti in a different part of Italy, which is different from the two comuni in the Meduna River valley, Tramonti di Sotto and Tramonti di Sopra, were often referred to as "Tramonti" for convenience. The new website for Tramonti di Sotto is http://www.comune.tramonti-di-sotto.pn.it/ unfortunately the new site does not list all the frazione as the old one did. Thanks for your email. It sure clears up a lot about the town name and location. Are you related to Della or Santa Rugo? I couldn't tell from the web site - I didn't see a Santa listed. I'm sure that even if you haven't found a relationship yet, you most likely are related somehow. Your web site is very nice. About the generation of John Moruzzi and Santa Rugo, I've seen that when Italians married, it was usually to someone from their hometown. May I use your email on the web page? I will include hotlinks to your web site and to the Tramonti site. Feel free to use the links or email. I don't know of a connection to Santa Rugo. The Val Tramontina was a very small and somewhat isolated location and young people often sought permission from the church to marry cousins since there were so few people available for marriage. I would expect that everyone was related if you could push the family ties back far enough. I realize now that there are no Moruzzi in my family information which is a little odd given the small size and interconnectedness of the population. Your comment about marriages seems very correct. The fact that people spoke local dialects may have had something to do with it. 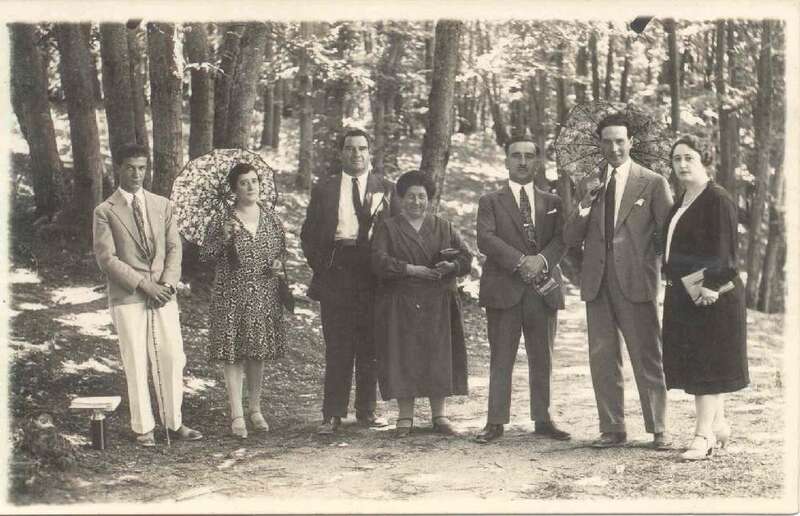 I have not yet updated the public part of my website, but recently I tied together my family and what I showed as unrelated families from Tramonti through marriages in Boston between people from the village around 1915. We corresponded back in 2007 about John Moruzzi and his wife Santa Rugo of Tramonti di Sotto, Italy and Dawson, New Mexico. You included some of the correspondence on your site. I went back to your site today because I have been working with someone in Italy who has undertaken an ambitious project to chronicle most of the families from Tramonti; his mother-in-law will be 100 years old in December and still owns her house there although they now live in Milan. He is at about 8,000 people. I was hoping to add your information about the Dawson people to his files, but have not yet found a connection to his information. 1940 census, 63y, boarding at the home of Orazio Primivieri. Married (but really widowed), Naturalized, 5th grade education, born in Italy, Carpenter at the coal mine. Terentiano diTella 67 years old at death, mother and father not listed. note: "Found in a coma. Never regained consciousness. Received Extreme Unction". I have managed to get a copy of Teridano's Death Certificate. He died in Dawson after being in the hospital for 11 hours. He died on 14 Feb 1944 at 9 PM. His SSAN was 525-03-1655. He was 66 years, 11 months, 11 days old. Occupation was carpenter for the coal company. Cause of death was apoplexy due to arterio solerosis. The death was reported by Oreste diCianno. He was buried on 17 Feb 1944 in Raton. The certificate does not list the names of his parents most likely because no one in Dawson knew who they were. Note: John Moruzzi, who Teridano rented a room from in 1930, died in 1936. John and Teridano must have been close friends. I suspect that, at some point, John and Santa moved to Pueblo and Teridano became closer friends with Oreste diCianno. Here is photo given to me by Giuliano. 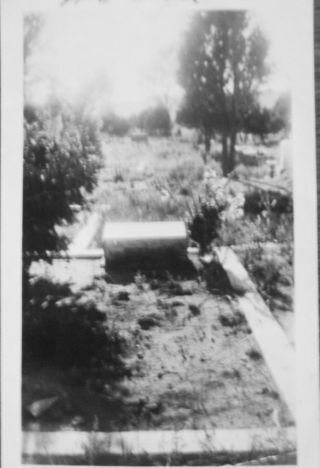 It apears to be dated 1968 and shows Teridano's original tombstone and grave site. Giuliano thought that Teridano might have been originally buried in Dawson and then moved to Raton. He thought this photo might really be Dawson. But on Teridano's death certificate, it shows the disposition of his body after his death in Dawson in 1944 as "Removal" to Raton. Here is Teridano's tombstone as it appears today. We don't know how or why it was changed. Di Tella , Teridano 1877-1944. I got this photo from Giuliano : Raton, NM, Mt. Calvary Catholic Cemetery. From the microfilm records from Dawson, we now know that he died on 14 Feb 1944 in Dawson, NM. For more photos of the Mt. Calvary Cemetery, here is a report of a trip I took to Raton in 2004. After finding the Probate number of Teridano's Will, I got a copy of it from the County Court House in Raton. There are no great surprises in it but there are a few pieces of information that show a little more about his life in Dawson. 1. The Will lists the four children of Treidano in Italy - Rinato, Vinicio, Licia and Goffredo. His property was to be split equally among the four of them. His wife Esterina had died in 1937. 2. The Will was orginally written in August of 1943. It was signed on 25 Jan 1944 (Teridano died on 14 Feb 1944). 4. At the time of his death, he was renting a room from Orazio Primaveri. I've found that family in the 1930 census with the wife running a boarding house. The house, in 1930, was located on Number 4 Hill so that is probably were Teridano died. Orazio billed the estate $12.50, for room and board for the partial month of Feburary. I learned at the 2008 Dawson Reunion from Erma Yob Schulte that the boarding house run by the Primaveri's was call "The V". 5. The priest who performed the funeral mass was Rev. Paul E. Hally from St. John the Baptist Church in Dawson. 6. The Phelps Dodge Mercantile Company was paid $304.47 for funeral expenses. 8. Witnesses to the signing of the Will were Joe diLisio and Joe Falletti. diLisio was the owner of a restaurant in Raton. Falletti worked at that restaurant. At the 2006 Dawson Reunion, I found three people who remembered Teridano. Look for their pictures in the reunion trip report. Here are their stories. These sisters knew Teridano in the 1940's. Their family was Yob and that family was from Austria. They said that their parents and Teridano were close friends. Erma recognized the photo of the older Teridano. She said that he had a beautiful Italian accent. They were fairly sure that Teridano lived nearby to them in the town (that is, not in one of the camps near the mines). They also knew the Moruzzi family. Ed lived in Dawson from 1923 until 1950. Ed remembered that Teridano was a carpenter and worked in the Carpentry shop. Ed also thought that Teridano was the boss at the carpentry shop at one time. Teridano made furniture including beautiful cedar chests. He thought that Teridano lived near the carpentry shop at the bottom of Number 4 Hill. Teridano also worked building frames of houses. I also met two descendents of Florindo Fraini and Rosa Iannacchione. They are Toni Muñoz Lenhart and Lita Muñoz Hinojosa. Toni and Lita both live in California. You can find out more about that family on the Dawson web page. 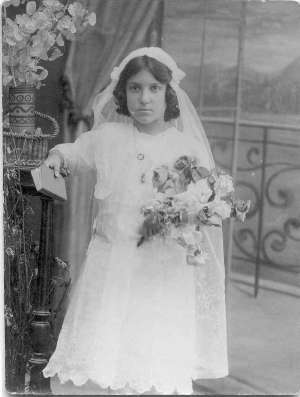 He married Esterina Angelica diSanza on 15 Feb 1905. They had four children, Renato, Vinicio, Licia, and Goffredo. My name is Colajanni Giuliano and I live in Rome, Italy. By GenForum I know that you have information about persons lived in DAWSON,COLFAX county, New Mexico. I am interested in finding information about my grandfather DI TELLA TERIDANO, probably died at DAWSON at first months of 1944. I got your email address from a lady who you sent an email several years ago. There were two email addresses so I am sending to both. Teridano diTella was the brother of my great-grandmother Doristella. Please look at my web site that describes my grandfather Emiliano Frazzini who went to Teridano's home in Dawson, New Mexico in the year 1912. I am hoping that your email address is still good and that you will reply to your cousin. I am sending a copy of this to Alfonso diSanza who is descended from Tommaso Cipriano diTella, Teridano's brother. I am excite your E-mail. My mother Licia Di Tella 89 age living, is the Teridano's daughter. Later, after office, i will write you for a long time . PS come te la cavi con la lingua italiana ? Compliments, your work is eccezionally. Yesterday evening up to 02 in the night I looked with attention your web pages. d) I have now the pictures of Cemetery entrance, Grandfather's head stone, Di Lorenzo family headstones ( four : two on each side of grandfather's stone). Just a thought. The headstones appears relatively new. Could he have been first buried at Dawson, then moved to Raton? To be descendant from: Renato, Vinicio, Goffredo, and my mother Licia. Esterina Angelica and sons never went in the USA. Grandfather Teridano only one time came in Italy during 1929. Goffredo is the last son and was born in 1917. Now, I don't know nothing through 1906 to 1929 and after to 1944. Mark I know Alfonso Di Sanza , in San Pietro Avellana our home are near. About my life I am a Technical engineer and work in a petrochemical engineering company in Rome. Photo sent to me by Giuliano. 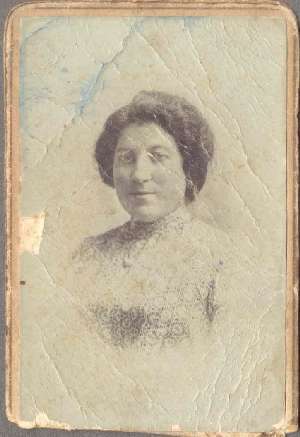 His grandmother, Ester Angelica diSanza, wife of Teridano. Born 29 Jul 1879, Died 14 Sep 1937. My wife and I visited with Giuliano, his wife, Rosalba, and mother, Licia, during a 2004 trip to Italy and they visted us during their trip to the US for the 2008 Dawson Reunion. Now over the years Giuliano and I have communicated very often. My wife and I visited them in Roma and San Pietro in 2004. I received a photo of Vinicio diTella from Alfonso diSanza. 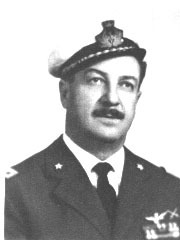 Colonel in the Italian Air Force. I met Licia in the summer of 2004 in San Pietro. She was about 90 years old and still alert. 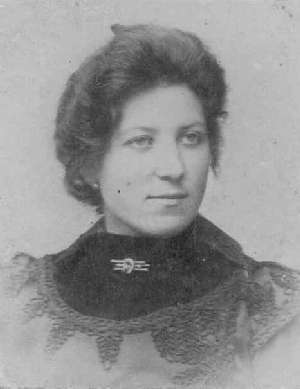 She was born about 1914-1915. 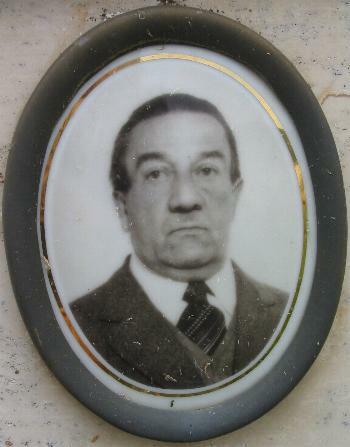 This photo is from his tombstone in the San Pietro Avellana cemetery. Polk's Pueblo (Colorado) city directory, 1930 : containing an alphabetical directory of business concerns and private citizens, a directory of householders, occupants of office buildings and business places, including a complete street and avenue guide, and much information of a miscellaneous character, also a buyers' guide and a complete classified business directory. Colorado Springs, Colo.: R.L. Polk Directory Co., c1930, 610 pgs. The R.L. Polk Directory Co.'s Pueblo city directory, 1923 : containing a complete alphabetical list of business firms, corporations and private citizens, a miscellaneous directory of city and county officers, churches, clubs, colleges and schools, labor organizations and secret and benevolent societies, etc. : also a complete classified business directory, "The buyer's guide." Colorado Springs, Colo.: R.L. Polk Directory Co., c1923, 541 pgs.